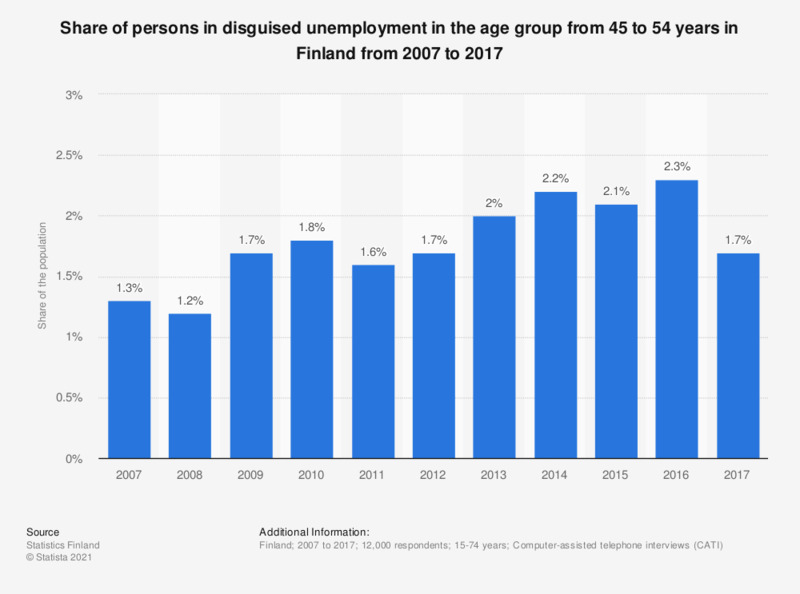 This statistic shows the share of persons in disguised unemployment in the age group from 45 to 54 years in Finland from 2007 to 2017. Throughout the survey period, the share of persons in disguised unemployment aged between 45 and 54 years fluctuated, amounting to 1.7 percent in 2017. A person in disguised unemployment is a person outside the labour force who would like to be gainfully employed and would be available for work within a fortnight, but who has not looked for work in the past four weeks. The reason for disguised unemployment is giving up searching for a job or other reasons, such as studies, caring for children or health reasons.